In early April I wrote of the need to utilize our mobile phone technology to address use cases ranging from personal navigation issues to large scale disaster response. On the small scale, my personal scenario involved getting lost on a mountain top after sunset in Jordan (wanting to retrace my steps with my iPhone). On the large scale, thousands of souls were lost on the coast of Tohoku, Japan when a tsunami struck in March, their loved ones not knowing where they were, even though many of them likely were carrying cell phones that could have been tracking their position, if there'd been an app for that. Subsequently, several crafty developers uncovered a location file that resides on iOS4 Apple phones. Unfortunately, there aren't ways to access this data in real time from the personal perspective, or from a server backup from a broader perspective. However, at the O'Reilly "Where 2.0 Conference", Pete Warden and Alasdair Allan demonstrated and published a program called iPhone Tracker for individuals to view their own device-embedded data. I recommend everyone try this if you're an iPhone user. 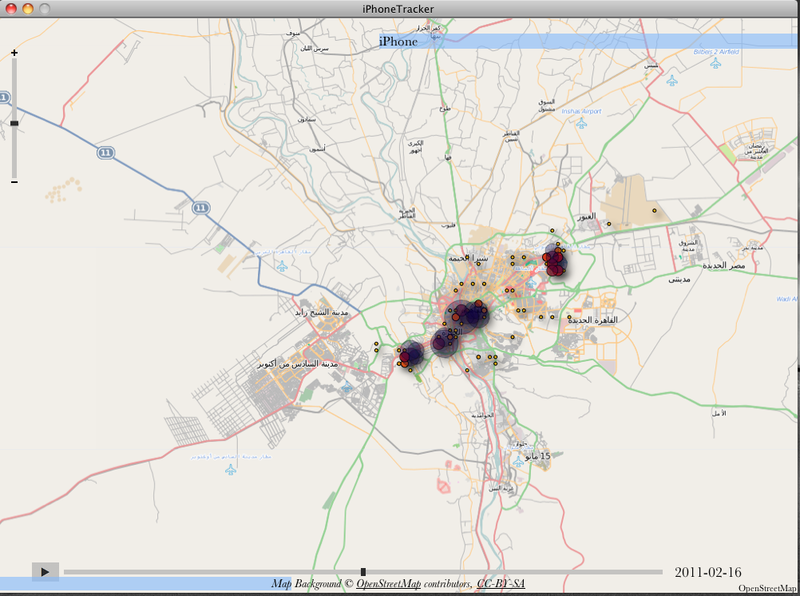 Using the iPhone Tracker application on my Mac, I was able to extract data my iPhone had captured during my trip through the Middle East. Upper left you can see my tracks from Egypt's southern-most town of Abu Simbel, along the Nile through Aswan and Luxor (Old Thebes) and on to Cairo. Zooming into detail on my Cairo stay, at right, you can see the day I spent at the Cairo Museum and Tahrir Square overlapped with the day I spent in the historic Islamic Cairo quarter, then two separate days for the visit to Coptic Cairo and the Citadel Mosque built by Salah ad-Din atop the hill to the south of Cairo to defend from crusaders. The far right cluster of points is my last few hours at the airport before departure. According to Apple he location file on iPhones is meant to keep a history of phone connectivity through cell towers or wi-fi hot spots as reference points to quickly render map data, not for actual tracking of a user. (The data stays on the phone and is not transmitted externally.) However, I see incredible value in an app that actually does transmit location information to an external server for the use of location-backtracking as I needed while in Jordan, or as relatives need to check in on the location of their loved ones in emergencies. As the technology is now prevalent to do this, it just takes the will and the time to make it so.